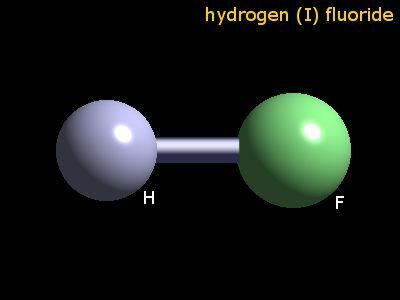 The oxidation number of hydrogen in hydrogen fluoride is 1. Dry hydrogen fluoride gas may be made in the laboratory by heating anhydrous potassium hydrogen fluoride and collecting the evolved hydrogen fluoride gas. Hydrogen fluoride gas may be made on very large scales (20000 tonnes par year) by the reaction of calcium(II) fluoirde, CaF2, with sulphuric acid. The table shows element percentages for HF (hydrogen fluoride). The chart below shows the calculated isotope pattern for the formula HF with the most intense ion set to 100%.